Wonderful! Thank you for posting it! 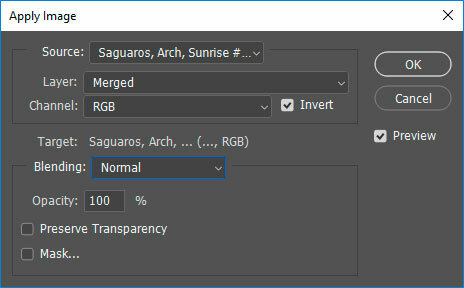 Don’t you achieve a similar – and far less convoluted – result by just converting the RGB file to LAB then using a curves adjustment layer to lighten the shadows in the lightness – L – layer. There is no colour or contrast shift here either – simples. I really don’t know. Haven’t tried that, Roger. As usual, there are multiple ways to do things in PS and we all get to choose which works best for us. It’s a great suggestion, so logical, that it falls into the ‘why didn’t I think of that?’ category. I think this is a great advice for using it with a wast majority of all printers. Thank you Tony. I also changed printers. I was stuck with 10 ink sets, instead of the previous 11 ink sets. My prints were dark and blacks lacked past detail. I used a levels adjustment layer with minimal improvement. Your path makes sense. I will be applying your fix. I use paper manufacture profiles. It’s certainly worth a try. I have a feeling each printer/paper may require slightly different settings. Maybe a different Darks-series mask or maybe a different opacity setting. But the consistency with which this works for me has made printing much more predictable and enjoyable. After reading the other comments, I feel the need to add more info. It would seem to be a problem associated with different printers and paper. My old printer was a Canon Pixima Pro 1. My new printer is the Canon Pixima Pro 10. My prime paper for in house is Glossy 2 by Canon. I send prophoto 16 bit files to the printer and use factory profiles. Yet I have the same issues. At some level, this may be an issue of lighting and how profiling software expects us to light our prints. If I put a strong light on my printed images, the hidden darks look a lot better. But, like I said in the blog, that’s not my normal light. I don’t know how the profiling software works, so I can’t rule out or rule in that it might be contributing to this problem. There’s lots of different variables that could be involved. The fact that this seems somewhat widespread would suggest looking for things these situations might all have in common. Hopefully the blog provides an easy fix if it is a problem for you. I consider this a very good , but actually also very old tip. I have been using this method for years ever since I saw Sean Bagshaw add his preset (with a screen blend mode layer set to 25 %) to one of the custom-buttons of the Tk panel (I think it was version 4 at that time). I very often like to add a custom vignette to direct the attention to the main point of the image and do so using the adjustment layer with no level or curve set to Screen blend mode around 25% opacity and either use a custom vignette, or a luminosity mask to distribute the light where needed. Not exactly the same but with very similar intentions and the use of an additional layer set to 25 % opacity screen blend mode with a mask for either a custom vignette or print-proof. Screen blend mode proves to be great again and again because there seems to be no color-cast unlike other blend modes. You may be entirely correct, Wouter. I didn’t do any research on this problem and it was new to me at the end of 2018 after getting the new printer. Did Sean use a Darks-1 mask in his video? That’s really the key here. A straight 25% Screen blend mode with no mask is not something I tried, but I can imagine it would move the lighter tones to being too bright. My approach was just to try to see if a luminosity mask could be useful in this situation. And as I mention in the post, it’s a somewhat obvious solution. The results, though, exceeded my expectations, so I felt it was worth sharing (again?). Yes. That sequence would pretty much mirror the approach I use. The one thing I didn’t explicitly mention in the blog is that I create my Darks-1 mask from the unsharpened image. I haven’t tested if it makes a difference to use the sharpened version. Probably not or a very minor effect. Hi Tony. As an aside, I was wondering how you like the Epson P800? I like it very much, but my previous printer was an Epson 3800. So this was a very easy transition to use this new printers and the results I get are very similar (after I do the Darks-1 adjustment). I’ve only used Epson printers, so really can’t make a good comparison with other brands. Thanks Tony – this is brilliant. I noticed the same effect when I replaced my 4900 with a P5000 and the new ink set. This is so much easier than going through a list of compensating adjustments in Lightroom. And more logical, too; makes perfect sense. Thanks Tony. I also use an Epson P800 and Moab papers and have had the same problem. I have been using Brightness/Contrast layers to bring out the dark areas. But your suggestion (Why didn’t I think of that) makes much more sense. Note: I use Epson Legacy Platine paper for shows and have not had the problem. Thanks for the feedback, Dale, and for confirming that you had a similar issue with Moab paper and the Epson P800. I really don’t know if this is just a Moab paper issue or not. I’m not using other papers at this time, but might give some Epson papers a try in the future. I have seen this effect with both Epson Premium Luster and Epson Hot Press Bright. I found that, on a landscape image with good shadow detail, a 30% opacity setting works well for the Premium Luster; haven’t tried it with the Hot Press Bright yet. I have used a P800 the last couple years with Epson Premium Luster, Ilford Gold Fibre Silk, and recently Red River Polar Pearl Metallic. I’ve had to open the shadows with the slider in LR or the bottom of the tone curve but have had mixed results re color shifts etc. Ilford requires the least adjustments. Red River Metallic is great for slot canyons. Michael Frye uses the P800 personally and in his photo workshops, prints primarily on Premium Luster and some of the Moab papers and has to adjust the shadows as the primary change for printing. He does have the monitor at D50, L80 for that. What do you have your monitor calibrated to when working on prints? D50, 80 lumens or D65, 120 lumens? I’ll try your approach over the next few days, I do have your panels. This would be great to put on NPN. Craig–Thanks for the feedback and confirming that this “dark shadows” issue might be somewhat common. I have my monitor set at 70 lumens, I think (Intensity = 70 cd/m squared). I’ll forward this to David at NPN and see if he’s interested in it. Thanks for sharing the approach Tony. I am sure to test it on couple images I have been challenged with for printing nicely. This couldn’t have come at a more perfect time. I have an image that needs this exact adjustment and also have the exact same printer. Can’t wait to give this a go! Thanks for a timely post. I too have changed to a P800 due to the unfortunate passing of my 3880, and it prints a little darker than the 3880. I look forward to trying your method. Really don’t know if it’s the printer, the paper, the profile, or some combo of these variables. Hopefully it will be an easy fix with a mask for you too. Many thanks for sharing that. I tried it on a couple of my images and was very happy with results. Looking forward to experimenting with it. working with the P800 also. Maybe you could do a short video on it sometime? Regards Phil. Thanks so much, Tony, for this email. I have an Epson SureColor P800 printer and have run into the exact same problem. I’ve just always add a levels adjustment layer with a midtone setting of 1.4 and have taken what I have gotten as a result. Your solution sounds much more precise, so I will start experimenting with it. I’m so glad to finally find someone who has acknowledged this problem, for when I’ve sought help before, I was told the problem was simply my technique. Hi Tony. Thanks for the elegant workaround. I am still using an Epson 3800 (believe it or not! ), and I struggle, at least with some images, in getting prints without muddy or blocked up shadow areas. 1. can’t you just sharpen after making final adjustments? 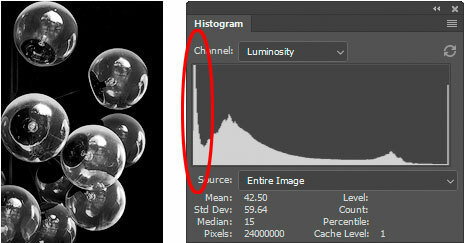 2. how exactly do you apply the Darks-1 mask to the adjustment layer – I’m struggling with this step! Gordon–I had an Epson 3800 until it started leaking. I had less problem with it and dark shadows than I do with the newer Epson P800. But there are many variables that go into making prints, so it’s a hard to say exactly what the issues might be. This technique is easy to try, and you can vary the results simply by varying the opacity of the adjustment layer. In answer to your first question, yes, you can make the adjustment first and then sharpen the image if you choose. The results should be the same. 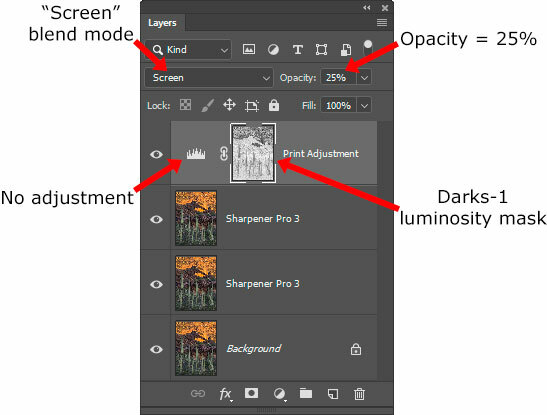 However, the advantage of making the adjustment AFTER sharpening is that after making the print you want to try an different opacity setting, that’s easy to do if the adjustment layer is on top of the sharpened image layer. Just change the adjustment layer’s opacity. 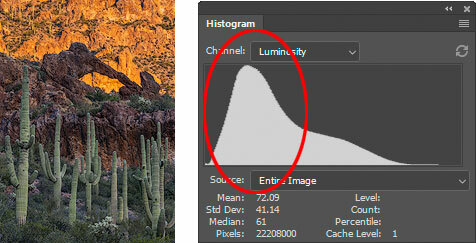 You don’t have to go back to the original image again and possibly have to run the sharpening process all over again. For your second question, if you’re using the TK Basic V6 module or the RapidMask2 module of the full V6 panel, just go to the OUTPUT section and click the “Apply” button. The panel will find your previously created Rapid Mask and apply it as a layer mask on the active layer (presumably the adjustment layer). If you don’t have one of these panels, the Apply Image illustration at the end of the blog will do the same same thing. Got it. Did you try more restrictive masks, e.g. Darks-2 or -3? Assuming the problem is just in the darkest tones, perhaps a Darks-1 mask is shifting some tones that don’t need shifting? Just wondering! Thanks again. I didn’t try other masks because the first test with Darks-1 worked so well. And so far it’s worked on all the prints since where I needed to lighten the dark shadows. I think it might be useful to try other masks, but you’ll maybe need a larger opacity setting on the adjustment layer to get a comparable effect to Darks-1. Tony, trying to follow the steps listed. As soon as I select Darks-1 in RapidMask panel (with background layer selected) it turns the image b+w. How do I create the mask to apply later after adding sharpening layer? I’m guessing that what you’re actually seeing is the Darks-1 mask, Mark, which you’ll use on the adjustment layer later on. If you’re using one of my panels, after you’ve created the Darks-1 mask, simply click the “I” button in the MASK section to return to viewing the image. Then sharpen your image as you normally would. Then make the adjustment layer as described in the blog and click the “Apply” button in the OUTPUT section to apply your Darks-1 mask to that adjustment layer. The Darks-1 mask will be waiting on the Channels panel until you’re ready to use it, and the “Apply” button will find it there and apply it to the active layer as a layer mask. This is a great tip, a genius stroke. Thank you. I am going back to my most recent prints for redos. I, too, am a recent new owner of a P800 – a special printer. i also had 3800 Pro, but mine was working well – just sold it. I download all of the paper icc profiles but find that these stock manufacture profiles are significantly different from the profiles I make using my particular printer and paper combinations. I use an Xrite ColorMunki Photo to create these profiles. I’m a little surprised at the number of people having the same problem. Hope you get good results with the technique also. Thanks for working on this and sharing it, Tony. I have had custom profiles made…Eric Chan and Andrew Rodney along with my own ColorMunki…and still have always had a problem with dark prints.I am looking forward to trying this out also with my P800. Glad you found the blog, Steve. I hope this fix works for you.